Our technology addresses High-side channelling, a well recognised problem experienced while drilling wells and cementing casing and liner strings. Due to the effects of gravity, any pipe (drill pipe, casing etc.) in a deviated or horizontal wellbore will tend to ‘lie’ on the low-side of the wellbore. The use of conventional casing centralisers typically has limited effectiveness, particularly in rugose or over-gauge hole. This creates an eccentric annular space between the pipe and the wellbore, with greater flow area on the high-side of the annulus. Fluid will always follow the path of least resistance, and therefore tends to ‘channel’ preferentially on the high-side of the wellbore. This leads to a significant imbalance in fluid velocities on the high-side and the low-side of the wellbore, with the velocity on the low-side typically being orders of magnitude lower than the velocity on the high-side. Low fluid velocity on the low-side of the wellbore leads to the formation of cuttings beds, because drilled cuttings are deposited on the low-side, and fluid velocity is not high enough to carry the cuttings out of the well. Centraflow’s technology is based on a relatively simple concept: downhole tools position flow diverter elements on the high-side of the well which force fluid to transition onto the low-side of the wellbore. The path of least resistance is physically altered and fluid velocity on the low-side of the wellbore is forced to exceed fluid velocity on the high-side. 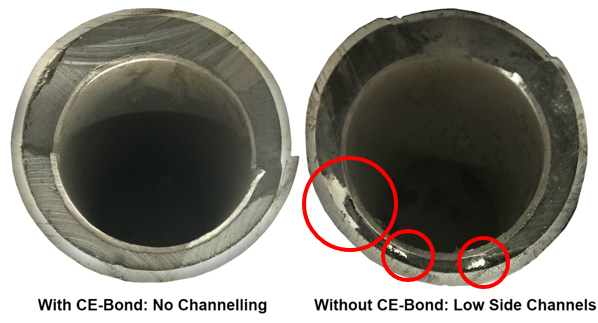 By physically eliminating the high-side channelling effects, cuttings beds can be removed from the wellbore, and full cement bond coverage around casing and liner strings can be successfully achieved. Centraflow’s key intellectual property is a broad patent which covers the application of flow diverter elements to preferentially restrict fluid flow across certain sections of the annular space between a downhole tubular (drill pipe, casing, coiled tubing etc.) and the wellbore. The concept behind Centraflow’s core technology can be applied in reverse to assist with gravel packing operations, and this application is also covered by our patent. Centraflow’s in-house capability to perform advanced CFD modelling using industry leading Ansys software facilitated concept validation, and is invaluable for optimisation of detailed tool design. In addition to CFD modelling, physical scale flow loop testing performed at our Aberdeen facility allows CFD to results to be calibrated against physical test results. Read more about CFD.